Our 2017 Timber Scorecard rates 128 companies on their publicly available timber buying policies, and performance towards sustainable timber during 2015-16. 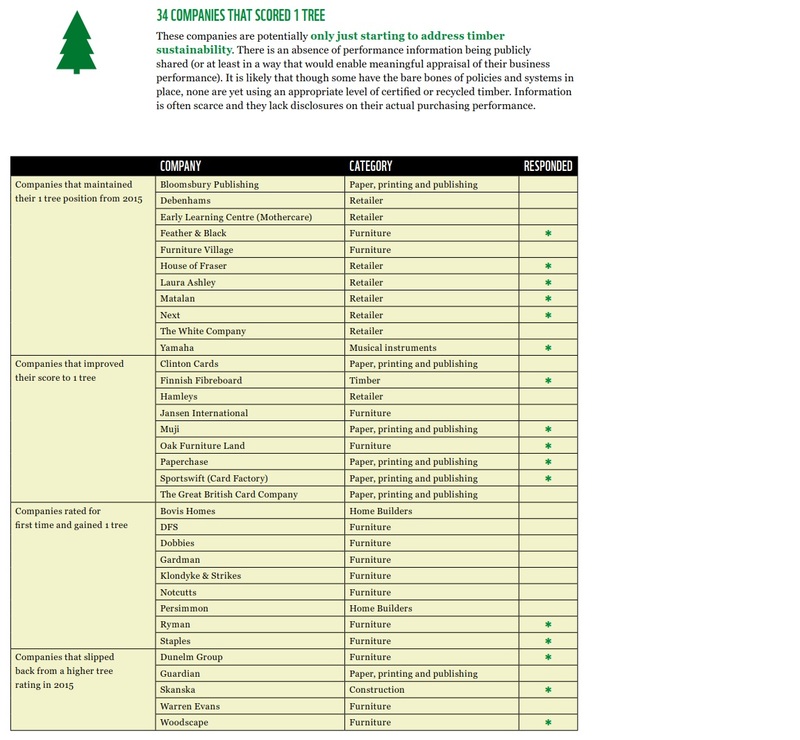 It also assesses whether a company’s performance has changed since our first Timber Scorecard which was published in 2015. The scorecard covers key sectors such as construction, home-builders, paper / printing and publishing, general retailers and furniture retailers. 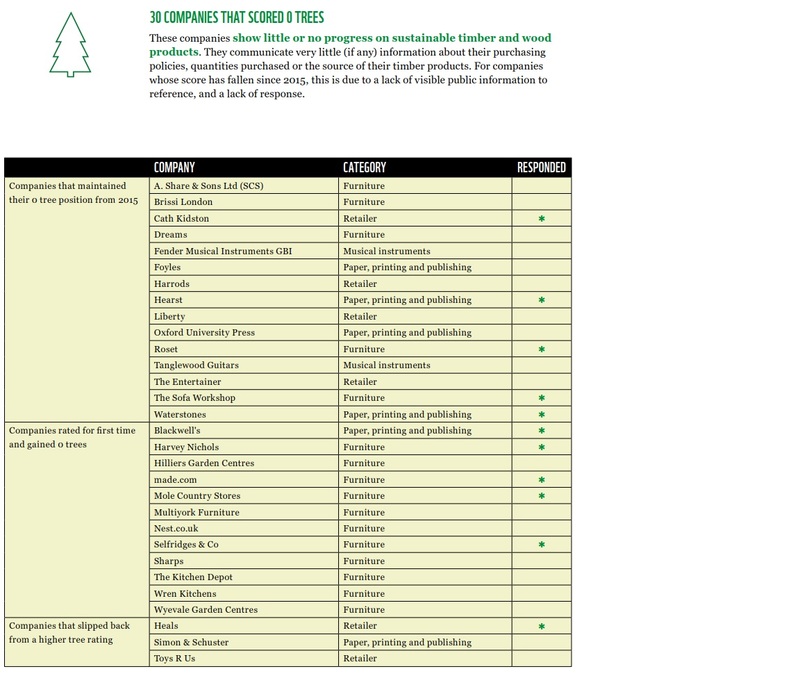 The scorecard awards each company a score from zero trees (no apparent progress on sustainable timber and timber products) to three trees, (sourcing over 70% certified sustainable wood and have policies and control systems in place). The next Timber Scorecard review is due in 2019. The musical instrument sector lags on performance with the highest performance only scoring a rating of one. 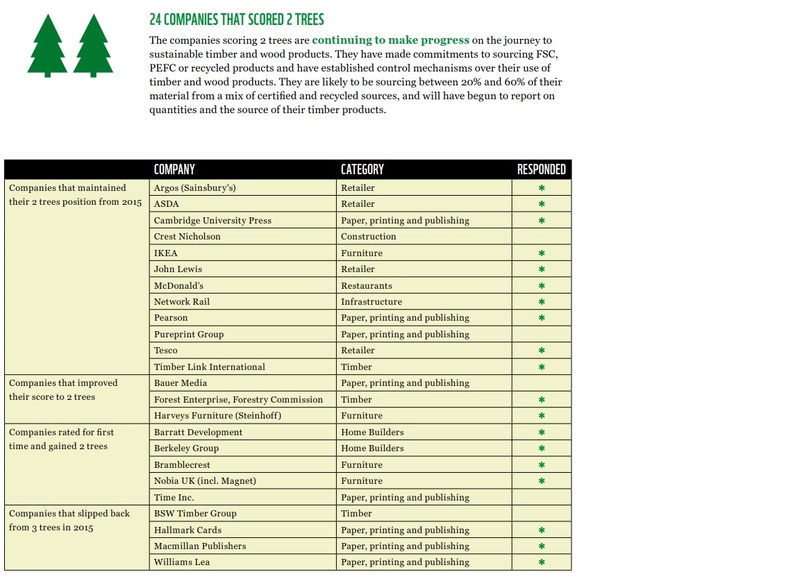 Some of the best performing companies include B&Q (Kingfisher), Boots, Sainsbury’s, Marks and Spencer, Tetra Pak, the Co-Op, WH Smith’s, Morrisons, Waitrose and Balfour Beatty, showing that it is possible for big names in diverse sectors to promote sustainable timber practices. We’re calling on UK businesses to pledge to buy timber products from sustainable sources (with high proportions of FSC and recycled timber) by 2020 to support the transition to a 100% sustainable timber market. We believe it’s important to highlight company performance to encourage transparency and action to implement and report on sustainable timber procurement. If your company would like to know more about sourcing responsible and sustainable timber, you can find out more through our Global Forest & Trade Network. 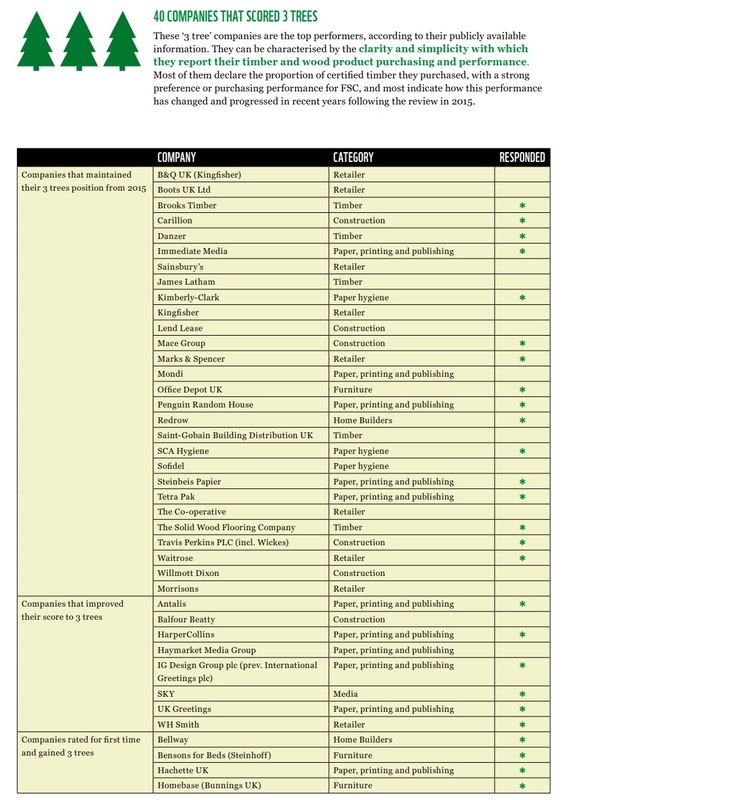 Below you can view the result tables showing the companies classified by their tree score along with information on how they scored compared to our 2015 review. The tables also show whether the companies directly responded to our requests for information.